The fact is, it’s a very blurred line … and with good reason. The point of both pursuits is the same – to enjoy yourself spending time in the outdoors and/or in outdoor activities. The differences, albethey slight, are in the level of comfort you choose to seek along the way. Camping accommodations can be under the stars, a tent, a trailer, or an RV. Glamping accommodations can be one in the same and you can probably add tree house, yurt, and cabin to the list for glampers. So if the accommodations can be identical – what separates camping and glamping? Well, in most cases, campers own or rent the shelter and gear that go with them. They acquire it, pack it, haul it, set it up, maintain it, take it down, repack it, haul it home, unpack it, clean it, and store it. For campers, these responsibilities don’t detract at all from the experience. In fact, they may enhance it. There’s pride in ownership, acquired skills and abilities, and the accomplishment of being able to say, “I did it myself.” Camping requires a time commitment on both sides of any given “camping trip” that can easily become a lifestyle. In most glamping scenarios, usually someone else owns the shelter and the equipment. When the glamper arrives, everything is already set up and in working order. The glamper pays money for this level of accommodation rather than using their valuable time to manage all the responsibilities the traditional camper takes on. Glamping requires far less of a commitment to any individual trip. You simply decide where you want to go, make the reservation, and show up ready to have fun. Campers tend to be greater consumers of products because camping “on your own” requires gear and equipment. Glampers are consumers of the services of outfitters. That’s actually what an “outfitter” is – a source that outfits you with everything you need for outdoor adventures. Where Do You Camp and Glamp? The locations for camping and glamping can be very similar, if not identical. In fact, many campgrounds that rent campsites to campers also offer accommodations for glamping. In the end, the weekend or week-long adventures will be nearly the same since the camper and the glamper will be staying at the same place. The services offered by a glamping outfitter can go far beyond just location and shelter. Some glamping packages include meals. There might also be resort services like housekeeping, massages, and guided outings (hiking, fishing, etc.). Of course, all of these are also available to the camper who seeks them out and buys them ala carte – all of which blurs the line between glamping and camping even more. The word “glamping” comes from the combination of “glamour” and “camping” which reveals that glamping tends to be a bit more luxurious than traditional camping. It makes sense. The outfitter who provides glamping accommodations probably sets up the tent or yurt at the beginning of the season and leaves it in place until the close of the season or, perhaps, even year-round. That makes it much easier to offer things like air-conditioning and real beds with box springs and mattresses. Such luxuries are not practical for the weekend tent camper. Tip: Go glamping in a tiny cabin at Big Cedar Lodge. Shepherd's Huts include a host of convenient amenities. Resources for finding and researching family camping and glamping adventures are also often the same. We've compiled a short list here covering many outdoor options. Take a look and don't forget to shop at Bass Pro Shops for all your camping and outfitter needs. 1. Top of the list, Big Cedar Lodge in Missouri. You'll find unique private cabins to amazing glamping units and everything in between plus a marina and much more! 2. With an increase in glamping, Glamping.com is an excellent source for outdoor experiences off the beaten path. 3. Explore campgrounds and more through ReserverAmerica.com. Plan a trip, make reservations and get outdoor and camping tips all in one place. 4. Consider Hipcamp. They offer leads to both camping and glamping adventures on their site. 5. Try Airbnb as it is a treasure trove of glamping opportunities including thousands of tree houses, yurts, and boats! 6. Glamping Hub helps glampers disconnect from their daily routine by giving them choices from tree house getaways to glamping weddings all over the world. 7. 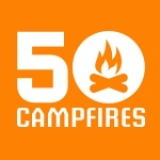 Don’t forget 50 Campfires is a great resource for information on both camping and glamping enjoyment of the outdoors. 8. A Yurt merges the worlds of tents, huts and houses. Check out Yurt Glamping in modern yurts some are insulated year-round for your glamping pleasure. 9. Also check out Harvest Hosts which arranges inexpensive RV camping/glamping accommodations at more than 600 farms, wineries, breweries, and more. 10. Camping in a KOA Kampground is an American pastime not to mention, Kampgrounds of America is the world's largest system of privately held campgrounds with almost 500 locations across US and Canada. Traditional campers sometimes look down their noses at those who choose to glamp, but why? It’s simply a different way to enjoy similar adventures. At the bottom line, camping and glamping are both about the pursuit to acquire experiences and fine memories with family and friends. Why judge how someone else decides to pursue them? In the end, sitting around a campfire toasting marshmallows and telling scary stories is the same no matter who started the campfire, isn’t it?